Far too much has been going on since my last post ages ago. My visiting son did help me so much to get so much done. Kid ‘N Ewe in Boerne, Texas was a great success – it was so nice to get to see many friends and family there. Unfortunately a seriously unpleasant person at that event has caused me to rethink whether it’s a good thing to trust “dealers” or not. This degenerate has chosen to put honesty and honor aside, to become profane, insulting, and simply severely mean. I’m actually broken hearted at this turn of events, but I will not stoop to this persons cesspool level of absolute and total dishonesty. I am profoundly honest and sincere with every person I come in contact with – even this disgustingly horrible person. My sales since that show have been astronomically successful. I will not Ever catch up – and will not continue trying, either. So many commissions are coming my way, so many overwhelming huge orders from respectable dealers flood me. I cannot keep up with it all. Still, I’ll only accept what is fun and challenging. Major changes in what I produce are on the horizon. A new price list is forthcoming. I’ll dispose of a number of items I normally carry. I’ve rethought getting help in production – it’s still ME. Yesterday Cat and I picked up our youngest son from Amtrack in El Paso – he’s visiting for the holidays and we appreciate Eric so much. James and his family are still in San Antonio, and Ann remains in Alabama. We’re visiting a dear friend in Albuquerque tomorrow for Christmas Dinner. We are so honored that she invited us. Last week I had the great privilege of selecting a giant amount of very nice exotic hardwoods at Albuquerque Exotic Hardwoods! Jake is a fantastic gentleman and I respect him & what he’s doing there. I’m a good customer. In that stash was a large board of exceptional Gabon Ebony at $300! 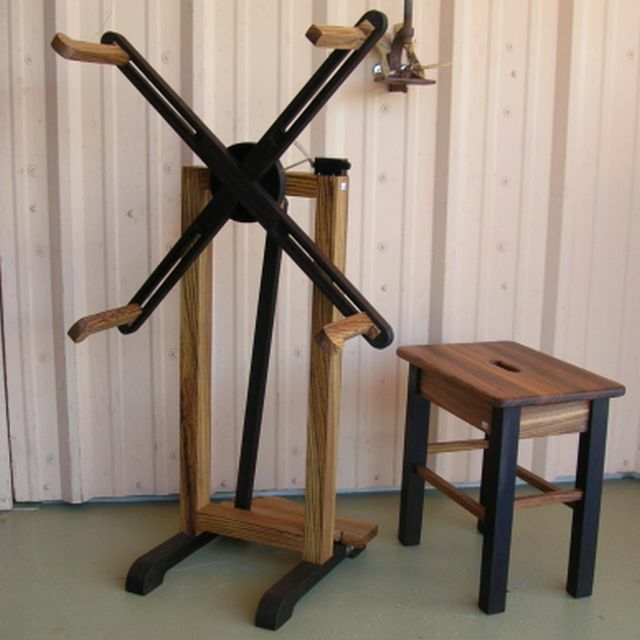 I’ve decided to make a very fine run of my Intermediate (9″ x 9″) hand looms! They will be pricey, but heirloom quality. I’m on the brink of announcing Exotic Wood Loom kits! SO many customers have requested them, and about 200 will be ready very soon. Rebecca Mezoff will be carrying her unique exotic loom kit to use in her classes. She’s such a wonderful representative and I appreciate her a lot. Other new things will come soon. Monday I was in the process of cutting preforms of tools for the loom kits when I had a seriously difficult event on the table saw. Due to my own mistake, a diagonal portion of my left thumb was removed along with a lot of tissue. I had ready a product called “WOUND SEAL” from Walgreens. It did what it promised – to stop heavy bleeding almost instantly. A visit to the ER and good medication, I’m going to heal, but slowly as it takes such a long time for such an injury. So, for those who have been looking for special items, it’ll be a few weeks. I will NOT ever do that again. Now, back to reintroduce myself to the table saw in a more gentle manner. Thanks to all of the honest customers of mine for your kind support. I respect all of you. Lids for the nottle bodies below. I’ll add the cork stopper and apply either a poly or lacquer finish to them all. Here are the nottle bodies. There’s great variety in color, woods, and shape. All are 1-1/4″ diameter holes. I’ll be making larger diameter containers in the future. Ah, the Flat Tapestry Needles! These important tools are such a joy to see in use – so many applications. I’ve gotta thank Teri Mauch for asking me to start producing these several years ago. Thanks Teri! These Bethe Shed sticks w/slot is the brainchild of our friend, Bethe. They are a utility tool that also has many uses. I’ll be adding photos later of other things in-progress like very very large runs of: Tami Beaters, Sett Tools, all three sizes of hand looms, Floating Sues, Sam’s Seam Tools, and others. I’ve added other woods to the Intermediate looms – they used to be all Cocobolo, but now include Katalox, Coraco de Negra & Brazilian Ebony. They’ll be ready in a few weeks. I did recently complete another 100 or so of the Cocobolo versions. My shoulders continue to improve, but far slower than I’d prefer. I’m hanging in there! Guess what I’m working on now! Yes, I’m back enough to slowly, carefully, and deliberately work on actual equipment. Right now I have three foot powered skein winders in progress. Today I hope to cut all of the mortises for joinery as no mechanical fasteners are used to assemble. 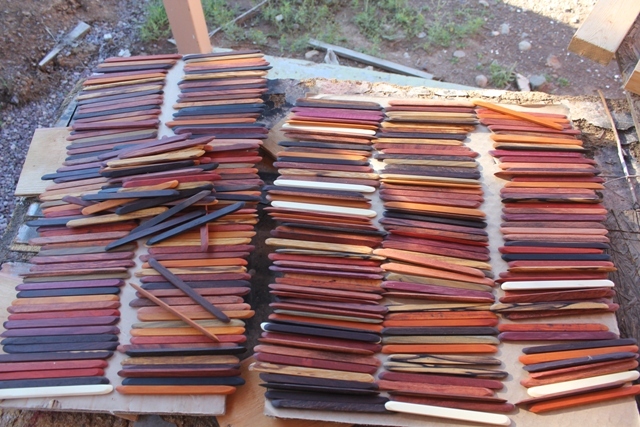 The woods for these three winders are very nice Bird’s Eye/Tiger Maple, Padauk, and Cherry. I picked planks that have good figure – and it’s so nice to get back to some real creativity. The sanding process will be a challenge for just can’t support the longer pieces with my right arm yet. So, will be using a random orbital sander to do that part. My plans include a large run of weaving/spinning benches as well. I already have about 40 tops and sets of legs cut and ready for machining. The stretchers are now a problem to fabricate when the time comes – some will be more of the copper pipe! A few tops will be from very fine Myrtle Burls and Claro Walnut. These woods are simply elegant and spectacular. My son James is working quite well helping me do the smaller turnings and small tool shaping/sanding. 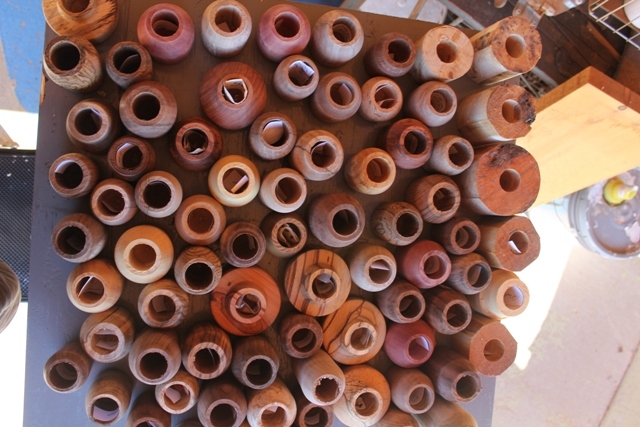 Next week I will start on finishing an enormous run of Nottles – hollow turned vessels with cork stopperd lids that he turned the bodies and lids. These are included in the Harwood Museum of Art Gift Shop – and the Taos Museum of Art has asked to carry them as well for a special show! I’m truly honored. I’ll be getting back to a very active production status between medical stuff still going on. Our September calendar is absolutely crammed….. My right shoulder is very slowly healing but my surgeon told me two weeks ago to expect a full additional YEAR for complete recovery. I’m paying particular attention to directions from my physical therapy doctor – Dan Lenari – in Socorro. I want to heal right! Riding my chopper is such a remarkable joy and I’ll never ever get used to it nor take it for granted. Cat’s trike is getting final customizations and should be ready this week. Next week we are taking a trike safety class in Santa Fe. I’m there more to support Cat, but I’ll learn too. Santa Fe is such a wonderful place to visit – and we did last week for a couple of days. The food was fantastic at Tomacita’s though I was reminded at why I should avoid all red chili – it promotes radically tough headaches for me for about 24 hours. The food was not worth the discomfort. And, we were rather disappointed at how much Jackalope has changed – it’s just not fun anymore. Here is wishing everyone a superb fall to come. The leaves on our trees are turning and falling already. The desert is beginning to take on that look of season changes, and the brilliant blue sky is so pretty. Just yesterday I saw Pronghorn Antelope, Elk, and Mule Deer on a drive to Socorro, with Turkey Vultures soaring above watching it all with keen attention. 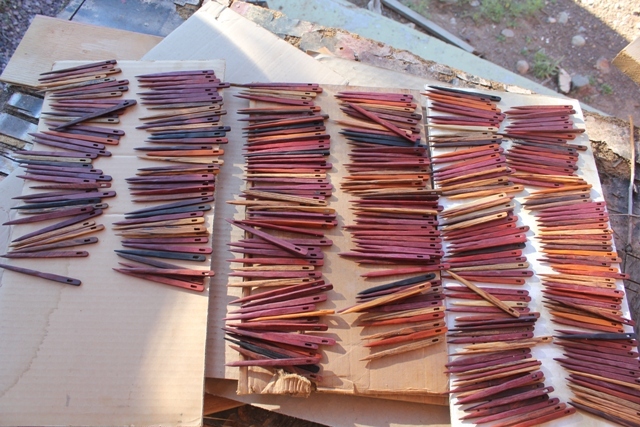 Tiny stick shuttles, nottle bodies and lids, Sam’s Seam Tool, little beaters, needlecases, double shed sticks (7″), tiny shed sticks w/slot, cigar pens, click pens, slim pens, seam rippers, needlesticks, flat tapestry needles, and round needles. There will be more. James is a fine craftsman with skills as good as mine. His standard of quality is comparable as well! He will not sell directly, and every piece he does will be finished and inspected/approved by me personally, without exception. I’m very proud of his work and hope that he’ll continue, perhaps even stepping into Hokett Would Work on a full-time basis someday. So yes, I will have time to do more work. It’s been quite awhile since I did a nice run of fine boxes – I’ve been totally sold out for about a year. Nothing will be offered that’s not perfect. My shoulder is much better and I’m using it more every day. Just today I spent about 5 hours there gathering tool preforms for James and planning the future of his involvement. 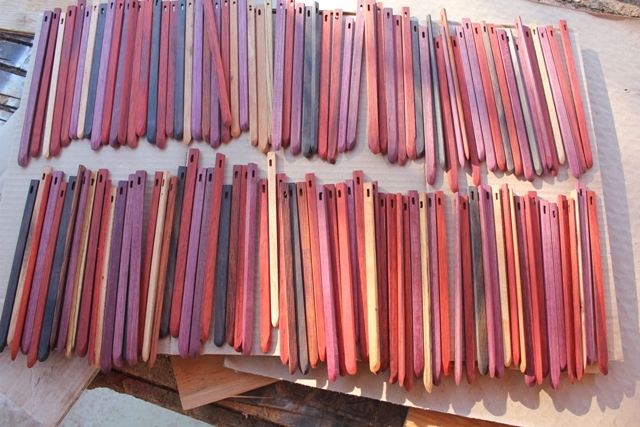 My machine activity was minor – using the table saw to cut blanks for 100 needlecases. The motion of my right arm is limited, so I’ll work into more involved actions as my shoulder permits WITHOUT jeopardizing recovery. Having help like this is such a blessing for which I appreciate. So yes, I have help and I’m most certainly better! 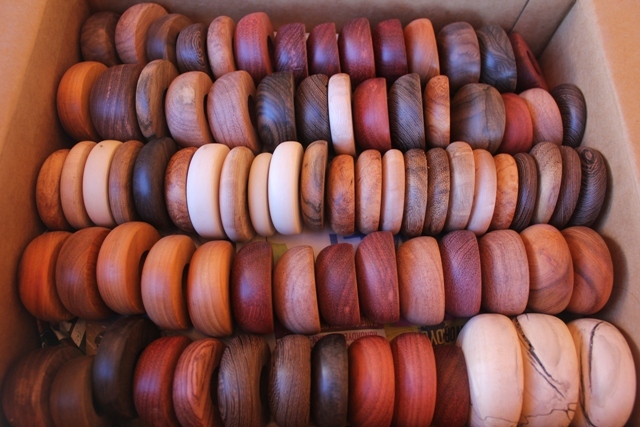 You should see the collection of exceptional woods I have waiting for my hands………………. This was an exceptionally fun piece of metal art that I did on a commission basis when we lived in San Antonio. 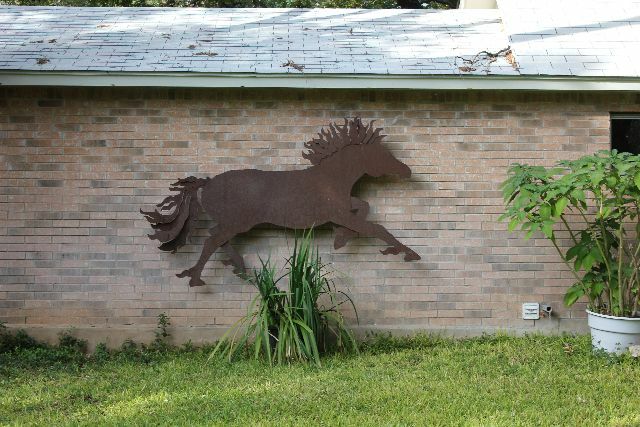 My wife Cat did the drawing and scaling up – and I fabricated this 10 foot long running horse for a friend. There were quite a number of pieces that made up the piece – all in 12 gauge steel sheet. I was inspired to mount it set away from the brick wall about 12″. At night it’s backlighted – and at the Christmas season the owner puts a stuffed Santa Claus on it. It remains one of my favorite pieces. The garage is set back from the side road in San Antonio and is visible thru several majestic oak trees. I remain honored that Sue and Ross trusted me with this project. Personally, I’m running in place – time passing – waiting for recovery from my latest shoulder surgery. It’s been 3 weeks today – and I’m still so affected by the procedure. Cat helps me remain so careful of the shoulder – encouraging my patience. I’m complying with her suggestions and the directions of Dr. Franco, but it’s so frustrating to be so idle for so long. It’s about three more weeks till I meet with the Doctor again, but knowing the reward for such compliance is great. I still have challenging pain, but not enough to go back to prescribed narcotics. Extra Strength Tylenol and personal resolve will suffice. I’ll soon be able to ride my custom chopper – and return to my shop too. So many things waiting on my platter of activity. I’d like to thank the Very Many friends and acquaintances for their support and encouragement during this time. I’m rich with pride for that support. Soon I’ll be back making lots of sawdust and creating fun tools, equipment, and so many other things. I continue to pack Very Many orders with Cat’s able help. Just wait till you see what I have planned! Next week we take Cat’s trike to Chuck for some more mods. Later I’ll return my chopper for a few things, including the clutch and brake master cylinders that are STILL at the machinist for stainless sleeves after more than two months. At least I haven’t been physically able to ride during this time. Suggestion. If anyone ever suggests rebuilding master cylinders, just buy new replacements instead. 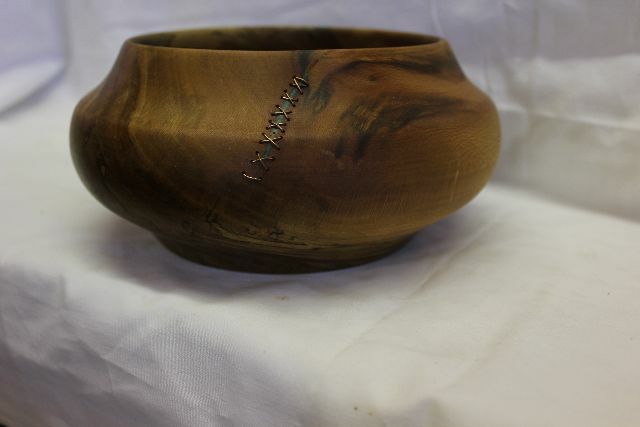 Here is a photo of a very special bowl that I made a few years ago. The wood is a specimen of Spalted Sycamore. The “wound” or natural cavity in the side was healed with sutures of a fine copper wire. The result was really neat. During a show a lady purchased this and another bowl to display on her credenza in her office. It made me very proud. I hope to get in a couple of weeks turning special bowls in a few months or so. Four wood lathes continue to call to me! I’m starting another road to recovery following my second shoulder surgery July 11. The procedure went well though the Doc reported that the damage was much worse than with the left. So, a larger prescription of Percocet has helped me thru the last week. Today I hope to wean off of that drug and am settling for Extra Strength Tylenol. I don’t enjoy having to take prescription drugs but understand the necessity to help the healing process. I do understand the need for such medication. During the past few days I’ve packed quite a number of orders ONE-HANDED – with Cat’s help to finish and mail. She’s a dear! Today I’m setting up about a dozen boxes of tools for a dealer visiting tomorrow from the Midwest to shop for her store. I feel so fortunate to have Dr. Franco of NM Orthopaedics to care for my shoulder making so much possible! I so look forward to getting back to the shop in about 5 weeks or so. It all depends on how my shoulder is doing. SO many things are in my plan to produce – some in preparation for my only show of the year – Kid ‘N Ewe in Boerne, Texas November 7-9. I’m not committed to any show next year yet. While I have packed orders, it tires me greatly, even small ones. Today is sorta sad for me not being in Providence, RI at HGA’s Convergence 2014 for the last day of their show. My physical challenges of this year have prevented me from doing many things I had wanted. Visiting with so many friends and customers at Convergence is a two-year highlight for me normally. Now, I’ll just look forward to 2016 and attending this most special event wherever it may be. Rebecca Mezoff represented me so honorably this year with her tapestry study using my little looms. I am significantly honored to be associated with this profoundly neat Tapestry Artist! Right now I’d normally head to the shop, but not this time. Soon. In my earlier post I had intended to make another announcement. My son, James of San Antonio, Texas, is now helping me with some small part turning, shaping & sanding of some small parts, and finishing of those pieces. Up until this point absolutely everything I offered was the product of my hands alone, save the finishing help from Sally Rogers here in Magdalena. 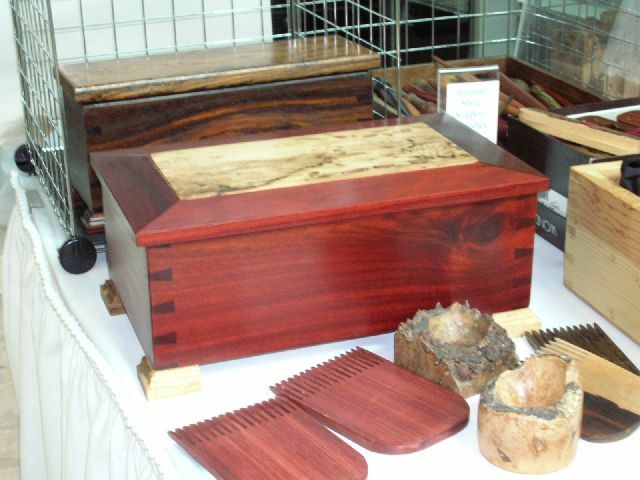 James is a very proficient woodworker and will add greatly to my ability to keep up with demand. Right now I have a good stock of just about everything. He will not be selling directly, so be assured that I’ll not present anything that’s not perfect and as good or better than I’ve ever offered. He has several boxes of parts to do – I send preforms or blanks ready to work. I’m so proud of James and the quality of his work. So, now the work I present to customers will STILL be only the product of “Jim Hokett”. I’m gonna hold on as long as I can with this life of woodworking which brings me such joy.